Tradeview: (Tradeview 2018) Value Pick No. 1 : QL Resources Bhd. This is my No. 10 Value Pick for 2017. QL Resources Bhd is one of our favourite back in 2015. When we called it at RM 2.40, we had a TP of RM 3.50 in mind. As it continued to be one of the Forbes best under billion company in Malaysia, we held on with a max FV of RM 4.30. We fully disposed at RM 4.30 in 2016. The key reason being the growth was stagnant. Their poultry, egg was doing alright but not great. The surimi business division is still the biggest contributor to the group. While we still had confidence in the company, especially under the stewardship of Chia Song Kun along with the other founding family members, there was a growth issue which indicates QL did not matter warrant the premium valuation with over 25x trailing PE. Entering 2018, we decided to initiate on QL once again. This is not because the lack of ideas but rather because the growth story and trajectory has appeared in this family run business. In fact, the growth story is so enticing we should have noticed earlier. 2 words - Family Mart. Why is Family Mart such a game changer? Usually analyst do not like it when a company diversify their business into areas not related to the core business. Two reason behind it - 1. It shows the lack of confidence in the existing core business 2. The company may have to assume certain risk in entering new business / industry. This was also one of our early hesitance. However, as of today, our doubts were all clear. A simple question to ask is would you enter a 7-11 or Family Mart if it was side by side? Additionally, the small snack / food segment of Family Mart is booming. Attracting crowds of all age. Their onigiri, green tea ice cream and curry balls. Of course if we were to share QL based on these alone, we are sure we will be severely criticised. So let’s go into the financial metrics and business side of things. 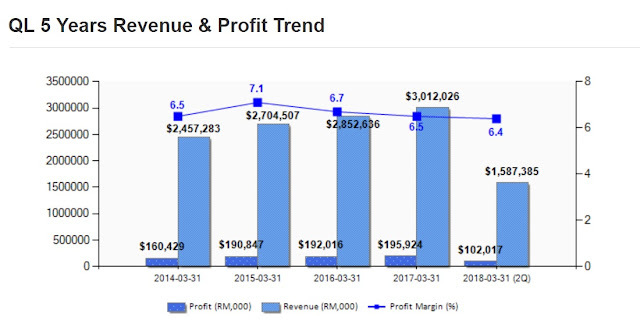 If you look at the past 5 year chart, it is obvious that QL have been performing consistently with both revenue and profit growing steadily. Of course, it would appear it reached a stagnant between 2015 to 2017. However, on the back of their expansion with the Family Mart business, things are looking to improve. Usually businesses diversification takes a longer time to reap fruits but the quick expansion abundant in retail lot supplies and low rental environment, it would appear that QL would be moving into profit territory quickly. 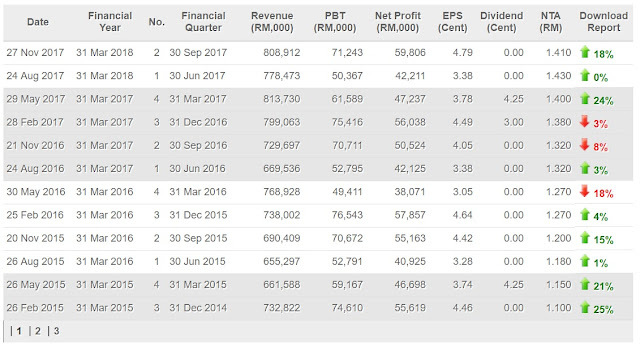 If we annualise the first 2Q of 2018, it would seem that QL may be able to achieve Rm3 billion in revenue + RM200 million in profits. Both are extremely good thresholds to break and it will only grow further in the coming years. Additionally, last year QL further declared a special dividend bringing the year dividend to 7.25 sens close to their record year. While the DY is not great, for the coming year, I will be more optimistic especially if Family Mart break evens. Additionally, a company that rewards shareholders albeit it is still expanding its business is better than a company that refuse to reward shareholders under the guise of expanding the business. Many good companies that are expanding even after doing well refuse to reward shareholders, QL management has maintained a consistent Dividend Policy through out the years. 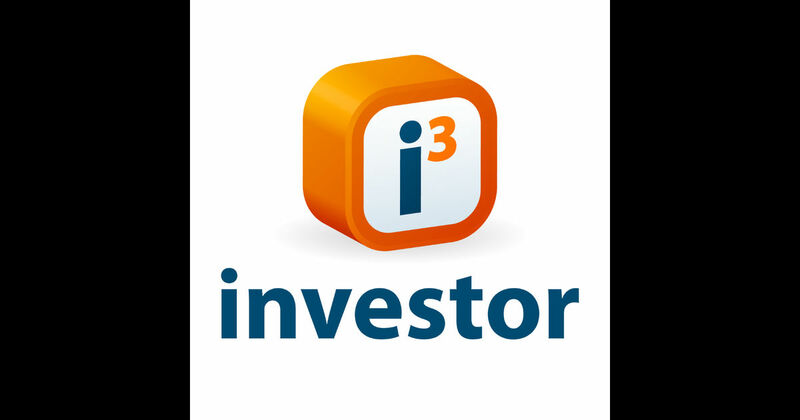 This brings me to the next point, investing in QL is a also a valuation play. How so? Traditionally, QL has been valued as a poultry, surimi and feed company. Now with their convenience store business, their valuation will alter. This would be especially true if they can win market share from 7-11 or MyNews. If you look at both companies' valuation, you will be amaze with the premium attached to both companies. SEM (7-11 Malaysia) is trading at 43x trailing PER and MyNews is trading at 40x trailing PER. QL is only trading at 34x PER with an expanding convenience store business arm. Hence, to us, QL is a very solid mid to long term valuation play. We would like to point out to all, another interesting business that was given premium valuation for a similar business model. Jaya Grocer reported a profit after tax of RM1.05mil on the back of a revenue of RM283.08mil for its FY14 ended June 30. This gives it a profit after tax margin of a mere 0.37%. The company has total assets of RM77.87mil. Jaya Grocer will be paid RM300mil for the grocery chain, valuing the entity at more than 30 times the price-earnings ratio (PER). It started in 2007 with its first outlet in Jaya 33 in Petaling Jaya. It has 16 outlets located mainly in the Klang Valley including The Intermark, Empire Shopping Gallery and KLIA2. The reason we are sharing this is to indicate the valuation of grocery chain vs Family Mart. 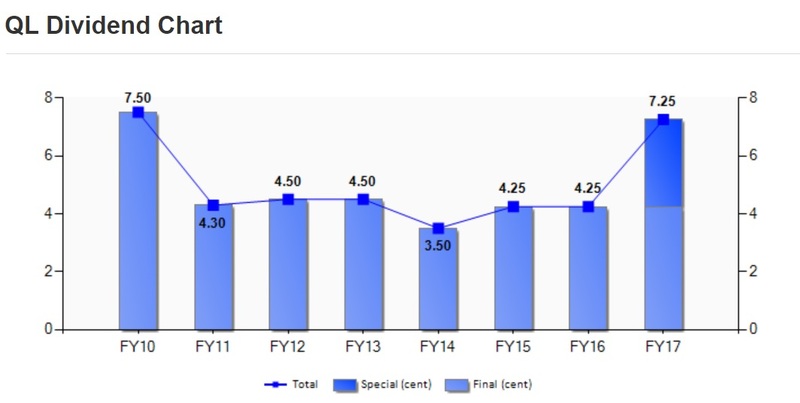 Although Family Mart business model would be more like 7-11, you can benchmark the business valuation to get an indicative value with discounts / premiums for store fronts and inventories. The similarity is the cash business and so long the cash flow management is strong, it will be a valuable gem. 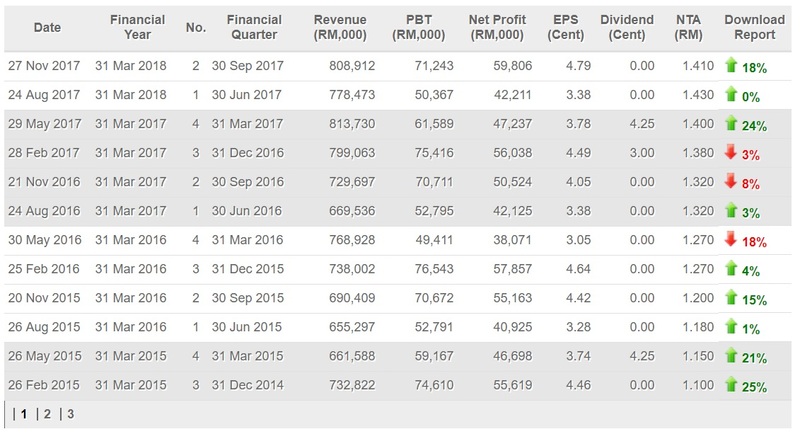 Our initial valuation for QL will be RM5 based on the back of 12.65 EPS at 40x trailing PER. This is our prudent estimation without taking into account of the growth of the other businesses within the group. For those who likes a solid management, boring but fundamental business with a expansion horizon, can consider QL.